What is the temperament of the Labradoodle and Australian Labradoodle? 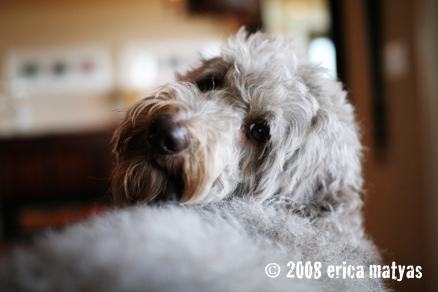 Labradoodles should be loving, smart, silly, and laid back. 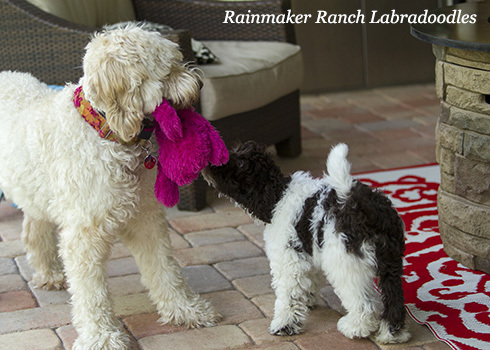 We are very careful in ensuring that the labradoodle parents of your labradoodle puppy have the same temperament you would want in a family labradoodle dog. We are three expert breeders working together, we only have one or two australian labradoodle dogs each and one litter at a time so we can focus on the labradoodle puppies and the families who are adopting them, our breeding dogs are loved family pets always living inside with us. We breed in our home under the supervision of our veterinarian breeding specialist, we do not cage or kennel our dogs or puppies. Our belief is that breeding is not a right, but a responsibility to the breeding dogs and puppies. Our Labradoodle and Australian Labradoodle puppies’ parents are very smart, silly, laid back, quiet, calm, intelligent, and bright. We can refer you to any of the owners of our dogs and puppies for positive recommendations. We are very selective of our parents and take great pride in our dogs or our program. Labradoodle temperament is based on the parents temperament, and grandparent temperament, training and care from 0-8 weeks in addition to never inbreeding. Our puppies have a great desire to be part of the family making them very easy to train and a joy to include in your family. Labradoodles are good watchdogs but are void of aggression. They are sociable with other animals including cats if socialized as puppies. Our Labradoodles are ever patient with children of all ages. We train our puppies as soon as feasible, they are potty trained to wee pads, taught to swim with ease, given a collar, taught not to bite or chew on people, are given lots of love and handling by kids and adults, given toys, inside & outside time as well as the beginning of basic obedience. They sleep in our home day & night & are taken outside to play many times a day. We do perform a puppy personality profile test at 6 weeks to be able to understand all our puppies & train appropriately, as well as inform our families' decision. Pictured at the top is Kiwi (Medium) and Luke (Mini). We strongly suggest a trainer, especially if you have young kids or special needs. Special needs families should consider a trainer necessary and a weekly part of their work for at least the first year to ensure the dog and family are working together. Although many families think training is easy and simple with this breed, training is not a one size fits all approach. Trainers meeting with families often can adjust behaviors (both the families and the dogs) before they become an issue that is difficult to address and many times personal approaches which may work for one dog do not work with others. 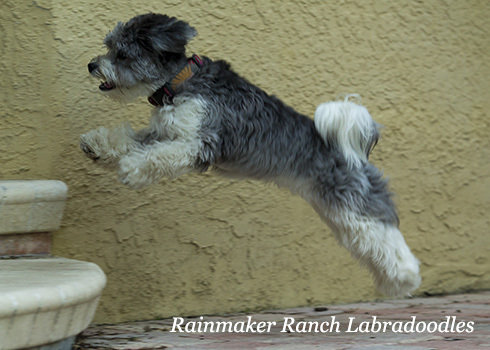 Good trainers have the ability to read a dogs behaviors and adjust training approaches. We strongly suggest you listen to your trainer and follow through IF you disagree with your trainer find another who you can work with easily. Trainers have incredible abilities, trust them. Labradoodle Temperament, difference of mini, medium versus standard labradoodle? There is generally a noticeable temperament difference between a toy, miniature and standard poodle. The champion show ring has caused breeders of poodles to sometimes select breeding dogs based on physical form and size versus temperament and health especially in the smaller of the breed. Inbreeding is also a common technique of toy and miniature poodle breeders. These are the main contributors to the difference. The hybrid vigor of crossbreeds can counterbalanced this negative temperament and health trend. In addition, most breeders of labradoodles, me included, refuse to breed to toy poodles and select miniature poodles for breeding based on temperament and health followed by physical form. Although we do breed minis we do not focus on size at the determent of temperament and health. The careful selection of both breeding parents is critical to your puppy’s temperament and health and should be the main criteria for all breeders. Using the selection criteria above I have noticed no temperament or health difference between our mini, medium and standard Second Generation Labradoodles and Australian Labradoodles. If breed correctly, Second Generation Labradoodles and Australian Labradoodles are easy going, up for fun, love to play, easy to train, love to swim and romp as well as just hang out with the entire family.